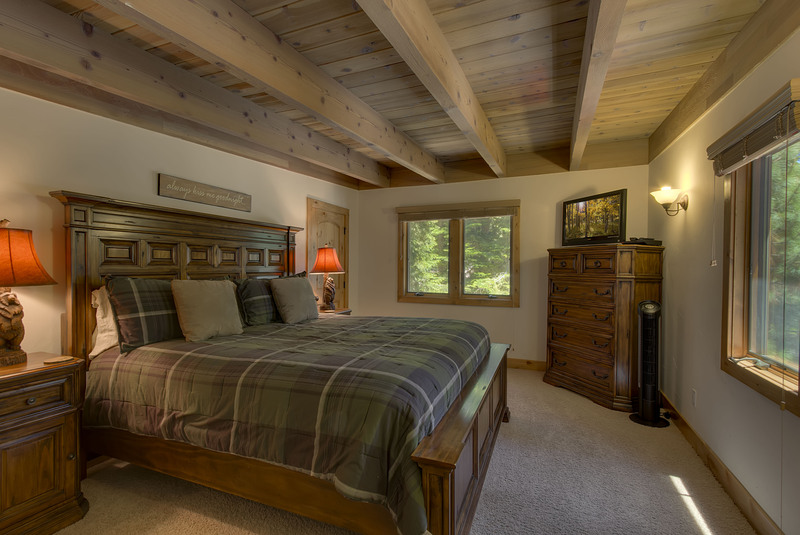 Welcome to West Lake Lodge, a beautiful, spacious family home in the Sunnyside/Tahoe Park area. Bring the family and friends, there’s room to sleep 12 guests! Put your feet up in the living room, relaxing on the comfy leather sofas and chairs as you warm up by the woodburning fireplace. There is a flat panel TV with DVD player, and Wi-Fi keeps you connected. The fully equipped galley kitchen is tastefully appointed with granite countertops, tile backsplash, and new stainless-steel appliances including a dishwasher. 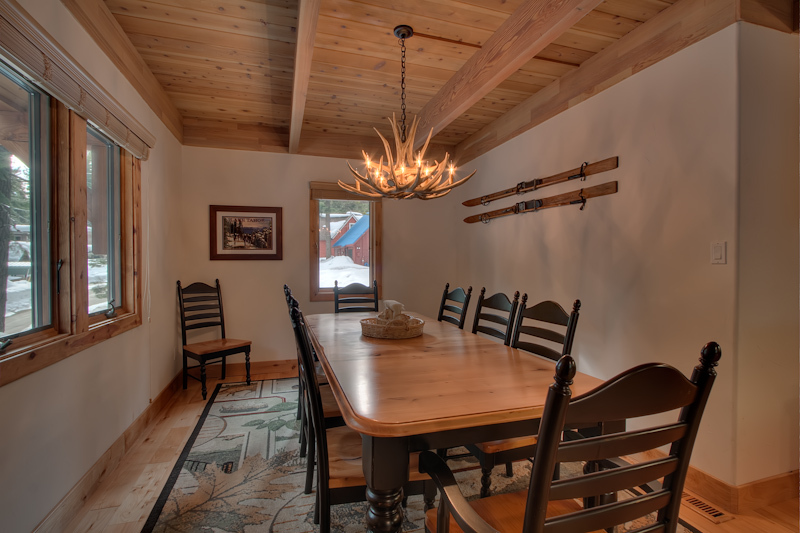 The dining area is open to the kitchen and the large table lends itself to family meals. 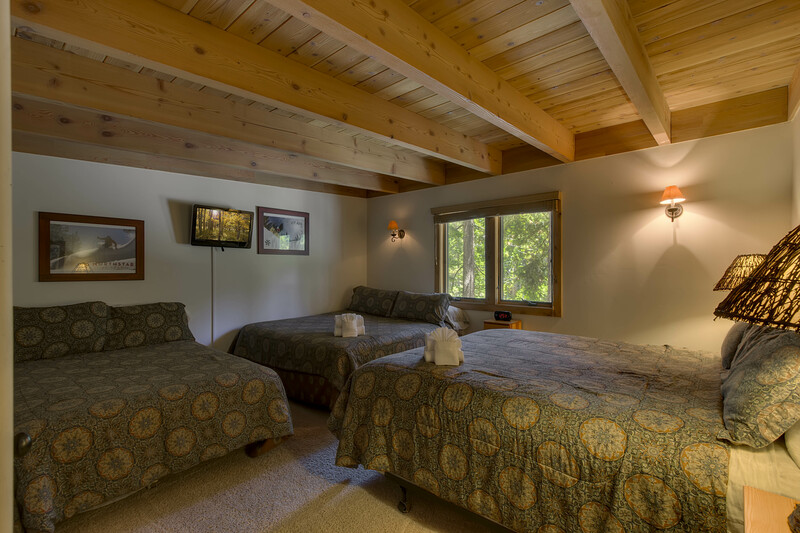 The main level also features a bedroom with a king bed, a TV and DVD player and a full bathroom. Upstairs you’ll find three additional bedrooms and two bathrooms. 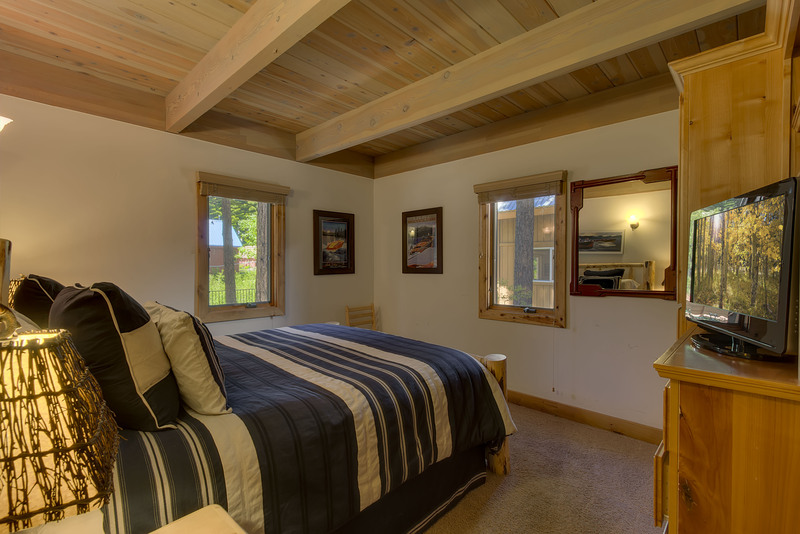 The master suite includes a king-size bed, walk-in closet, a TV and DVD player, and a fantastic bathroom with a copper sink, soaker tub, and walk-in shower. The third bedroom has two king beds, a full-size bed, TV and DVD. The fourth bedroom has a king size bed with TV and DVD player. The home also comes with a washer and dryer. The front deck includes seating and a gas barbeque available year-round. With an oversized two car garage and additional parking in the driveway, this home is perfect for two families. There is a hot tub where you can soak your aches and pains away. 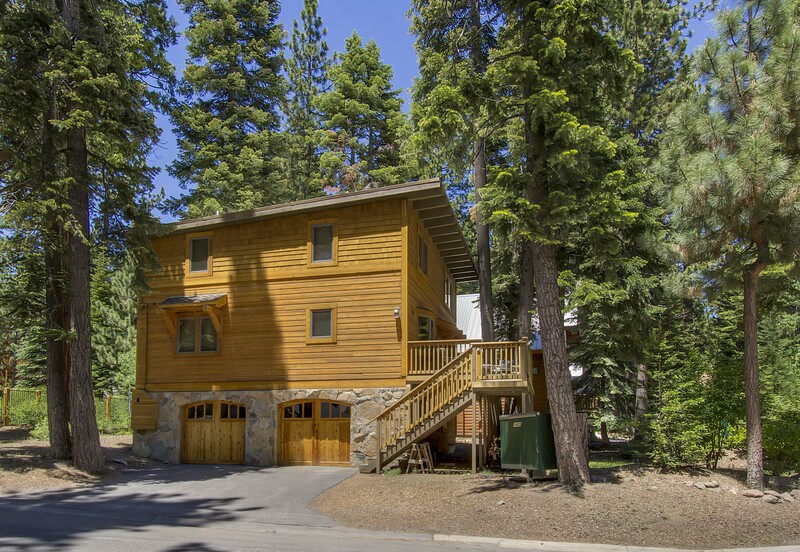 Located on West Lake Blvd, the home is approximately one block from Tahoe Park’s amenities. Stroll down to the terrific beach, picnic area, volleyball and basketball courts, horseshoe pit, and playground. After enjoying the amenities, venture out! Sunnyside Restaurant, Fire Sign Café, and Spoons Café are also a very short walk from the property. West Lake Lodge is in a terrific location for both summer and winter stays. Tahoe City and Homewood Mountain Resort are only three miles from the property. Homewood’s tagline says it all: Where the Mountains Meet the Lake. From the lake to the lift there are 280 steps and a gain of 1,650 feet elevation—your reward is an extraordinary lake view. In addition to downhill skiing and snowboarding at the resort, Homewood offers guided Snowcat backcountry skiing tours and wedding/special event planning. In Tahoe City, visitors can enjoy scenic Nordic skiing, sledding, and snowshoeing at Tahoe XC and at the new Tahoe City Winter Sports Park. In warmer weather, Tahoe City boasts beautiful beaches, a lakefront bike path, and outfitters with stand-up paddleboards, kayaks, sailboats, and jet skis to explore the lake. Boaters may take advantage of the full-service Tahoe City Marina and boats can put in or take out just down the road at the Lake Forest Boat Ramp. Enjoy a round at the Tahoe City Golf Course or traverse the many stunning hikes and backcountry meadows. Skylandia State Park and Beach is 11 miles north. It has a grassy park area complete with grills, picnic tables, and public bathrooms, and a sandy beach with views up the lake toward Mount Tallac and South Lake Tahoe. The park has a boat launch for both motorized and non-motorized watercraft. 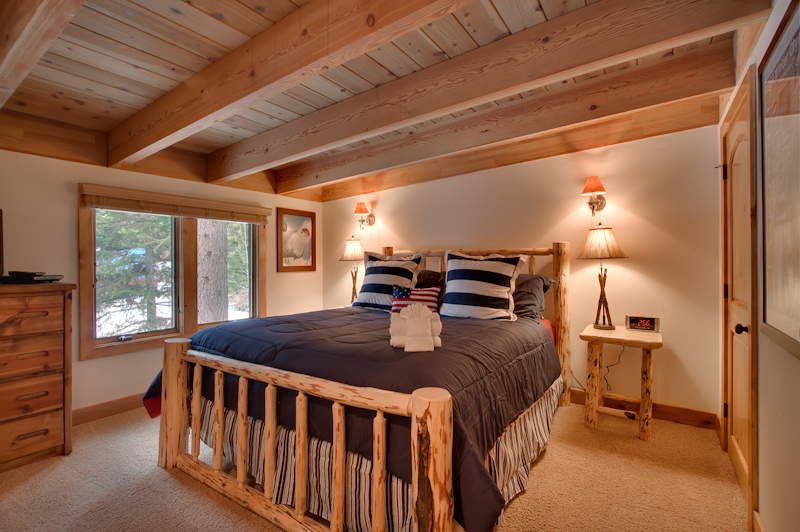 West Lake Lodge is a short drive from Alpine Meadows and Squaw Valley Ski Resorts. After taking on the slopes, go tubing with the kids or try out the mini snowmobiles at SnoVentures Activity Zone. There are dogsledding tours too! In the summer, ride the Aerial Tram to High Camp then walk or hike along one of the scenic trails in one of the most breathtaking places in the world! At 8,200 feet elevation, admire the beauty of the Sierra Nevada Mountains with views of Lake Tahoe and Squaw Valley's legendary granite peaks. In the Aerial Tram building lobby, kids and grownups can have a blast climbing the variety of routes on the 30’ simulated Headwall Climbing Wall, then head over to try a somersault at Sky Jump. Very very nice, clean home. Everything you need is there. Great location. Would Highly recommend this home if you are looking for a spot around North Tahoe. Rental host was great to work with. A true professional. Sleeping for 12, comfortable and well furnished, clean, close to beach, restaurants and shopping. Loved the location. The walkability was amazing . Unfortunately the bath mats and entry hall mat were dirty. No toiletries in the bathrooms besides soap. The sink in the master as well as the upstairs bathroom sink and tub were very slow to drain. Overall we had a nice stay. Our family vacation with 2 families was perfect at this property! House was fully equipped to make us feel at home. Close to all activities yet far away enough from busy south side of Tahoe. Rental host made the process seamless. 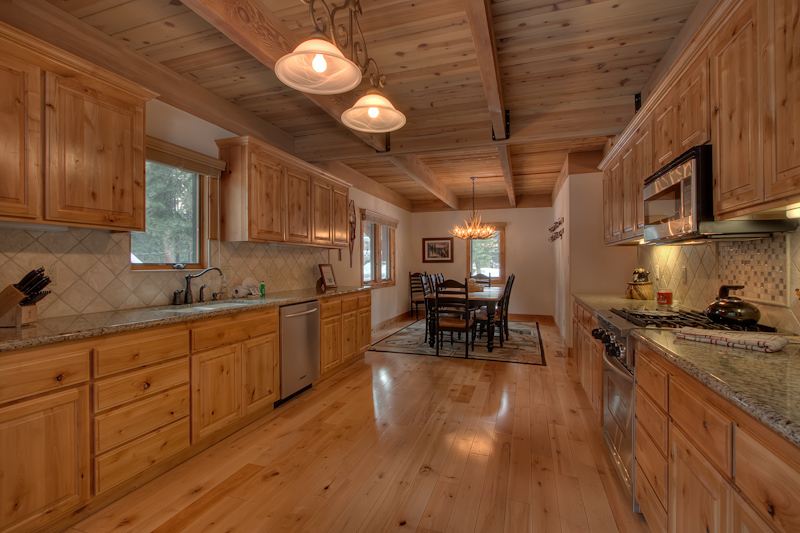 The house is gorgeous, with a particularly beautiful kitchen and master bathroom. However, it's right on Hwy 89, which means it's quite noisy. Cal Trans happened to be doing some work right outside the house every night we were there, all night. Even without that, though, you would hear the cars going by, all day and night. But overall, a very nice place, close to the lake and several good restaurants. We were two families, and the lodgging was very confortable. The kitchen was very well equiped. We enjoyed it very much. We had four families with young children. House is well maintained and very clean. Beds were very comfortable. Management company was very professional and easy to communicate with. Slight problem for our large group was the smallish living room. Wished for a more open plan to accommodate large group like ours. But this is pretty minor - we enjoyed the house and would definitely return. Comfortable and clean. EASY walk to Tahoe Park Beach, Sunnyside and Fire Sign Cafe. Perfect for our family! It was really well. The house was in a ideal location and accomendated 10 adults and 2 kids perfectly. The private access to the lake was unexpected but a great touch. We will definitely be coming back to Lake Tahoe. Great house, great location. Clean, modern and a short walk to the beach, bike rentals, restaurants and groceries. We had some trouble figuring out the TV/DVD player combo but managed to get it to work after about 15 min. The hot tub was a definite plus. Price was reasonable. We enjoyed our stay here in Tahoe minus the house being right on the main highway, which normally wouldn't be so bad but they were doing construction right in front of the house which proved to be noisy. House was nice though, updated nicely and close to beach, stores shops etc. This house was perfect for our group. Great location near restaurants and a grocery store as well as access to the lake. It's also a few miles from Squaw/Alpine ski resorts. The home was very comfortable and the management company was very professional. This house was perfect for 7 adults. Thanks for a great weekend. My friends and I just rented this home for 4th of July weekend and it was great! The home was right on West Lake Blvd. so there is some noise and traffic but we didn't mind. The location great though, across the street from a great beach and less than a 5 minute walk to Sunnyside. This was a huge plus for us. The home itself was also very nice. The living room is a little on the small side for a large group but the kitchen/dining room area is very large and open which was great for our group to hang out in. 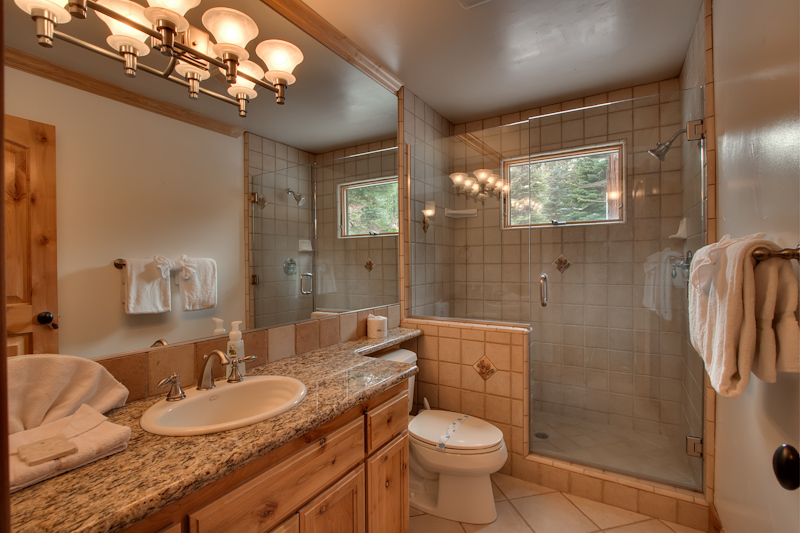 The master bathroom was especially nice (seemed like it was a little more updated than the rest of the house). One thing to know is that the hot tub is in the garage. We still used it, but this was a little strange, probably nice in the winter but would have rather had it outside for summer. All in all this is a great house, especially for a group that wants to be conveniently located to this area. Good everything is fine, except hot water. we stayed 10 People. Only 6-7 people got got hot water. My family stayed here for a few days and we spent our Christmas here and we had amazing time! I would recommend for anyone to stay here. 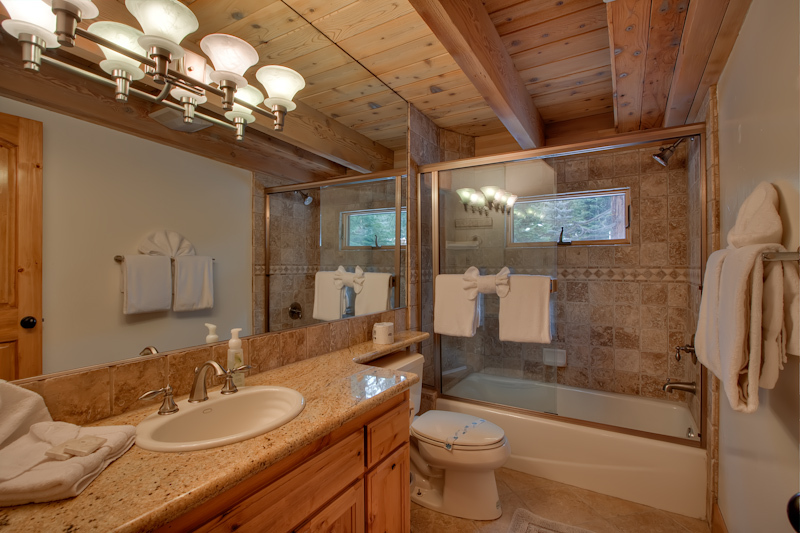 The home is located in a great location - within a 10 minute drive to Squaw Valley. The kitchen is very well equipped, the dining room is spacious, they have DVD options for us to watch, the rooms are comfortable. We were a family of 8 - 5 adults and 3 children and we were very comfortable here. The only caveat was that the home is next to a main street, the internet was quite slow and that the hot whirlpool bath was in the care basement. We had an amazing time nonetheless - and we very much enjoyed ourselves. The staff managing this apartment is also professional. I would highly recommend this home to anyone! My dad and brothers and a couple friends flew out for a ski weekend. We hadn't been together like this in years and had a great time. The house met our needs very well. the furnace broke down during our stay due to deferred maintenance and a dirty filter, but 1st accommodations had someone out within an hour with little inconvenience to us. Had a great time at the rental property.Was perfect for our needs. Even had baby gates which came in handy with the 3 toddlers we had with us. Great house in a wonderful location! We stayed at this home with another family and it was perfect. The location cannot be beat and the home had all of the amenities and space that we needed. The kitchen is especially nice for group cooking. The only problem we had was that our cell phones did not work in the home, but that is to be expected when in Lake Tahoe. We had to call the management company for a few things and they were really responsive and helpful. We will definitely stay here again! It was the perfect location, my family (22) all in the area frequent Sunnyside, Fire Sign and that wonderful new Market, close to beach and park, well stock home! Our stay was amazing no complaints at all! The cabin is even better in person! Can't wait to book it again in the summer. We stayed at this house over this past weekend and had a wonderful time. The house was great- it had a ton of sleeping space. Also, the location was great. Lastly, the property manager was extremely helpful and nice. #WS108 - It would have been nice to have a third bathroom. overall the cabin was very clean and nice. wish there were recommendations on where to park additional cars as there was no street parking available. This is a great house and we hope to return! The location was perfect and we loved the deck, tvs in the bedrooms, and large, well-stocked kitchen. The only suggestion would be a recreational activity in the basement (ping pong, air hockey, foozeball, etc.) or a video game system. Good place to stay if you eat out not cook. Everything was nice and clean but no one told the oven is not working and we had all food which is backed in oven .Tried the BBQ grill and that was not working either even bought new gas but still the grill was messed up. Trip was good but without food. We tested the oven and the bbq and both are working fine. sounds like user error, however we would have assisted them if we'd been notified of any issues.